Mulled Apple Cider delivers warmth and cozy spices for the cold weather season. This homey brew is made in a slow cooker for an easy recipe! With fresh apple cider readily available, don’t miss the opportunity to whip up a batch of Mulled Apple Cider in the slow cooker. Whole spices, fruit and cider simmer to make a comforting hot drink to fight the chill of fall and winter. 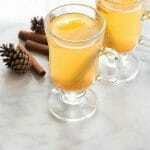 What is Mulled Apple Cider? Hot Mulled Wine is winter tradition originating in Northern Europe. Red wine is heated and combined with aromatic spices to make a cozy beverage to sip fireside in the winter. 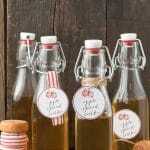 An example of this is a Scandinavian version of mulled wine called Glogg. 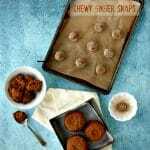 It’s delicious and the spices can be combined (dry) with a bottle of wine and the recipe as a great hostess gift! For youngsters and those preferring not to drink alcohol, mulled apple cider is a great alternative! Anything taking advantage of the fix-it-and-forget-it ease of the slow cooker is my speed this time of year too. Apple cider is made of fresh apples ground into a pulp and juice is extracted from the pulp. This is why apple cider is often cloudy or labeled as ‘unfiltered’. Because of the extra apple matter, apple cider always must be refrigerated and is perishable. Apple juice is solely juice from apples with no other part of the apples. It’s clear and a golden color. TIP: apple cider can be frozen! If you can find it freshly made in the fall, stick a container in the freezer ensuring some space at the top for expansion when freezing. You can enjoy it and use it in recipes all year! What Ingredients are in Mulled Apple Cider? I love the availability of fresh apple cider at this time of year. Personally, I love the more rustic quality of the apple particles that swirl around as you drink it. 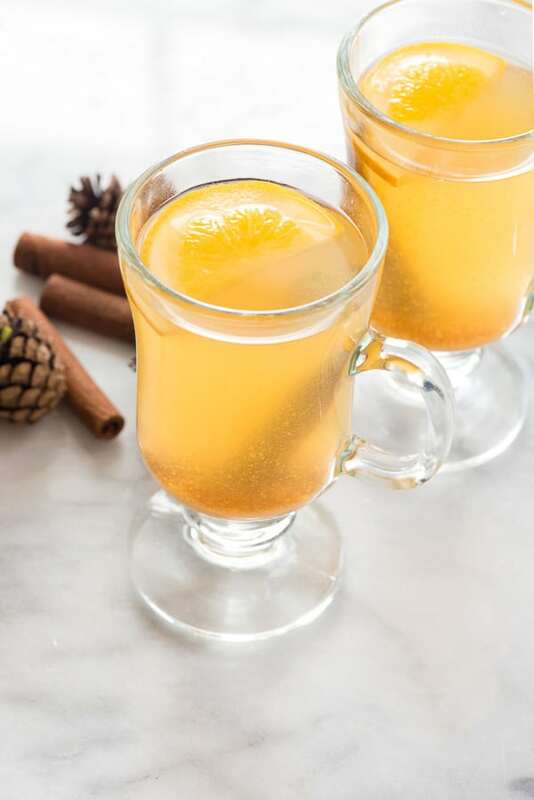 It has a naturally sweet flavor as well, making it easy to build on for this delicious slow cooker mulled apple cider recipe. This mulled cider recipe uses whole cloves, allspice berries, fresh ginger root, cardamom pod and cinnamon sticks. Some orange slices and lemon peel for great flavor. Whole spices are easier to strain out before serving. Ground spices can create an undesirable gritty texture to hot drinks in my opinion. If you don’t want to deal with straining the cider, the allspice berries, cloves and cardamom pods can be wrapped in a sachet made of cheesecloth, tossed into the cider and then easily removed once the cider is done simmering. 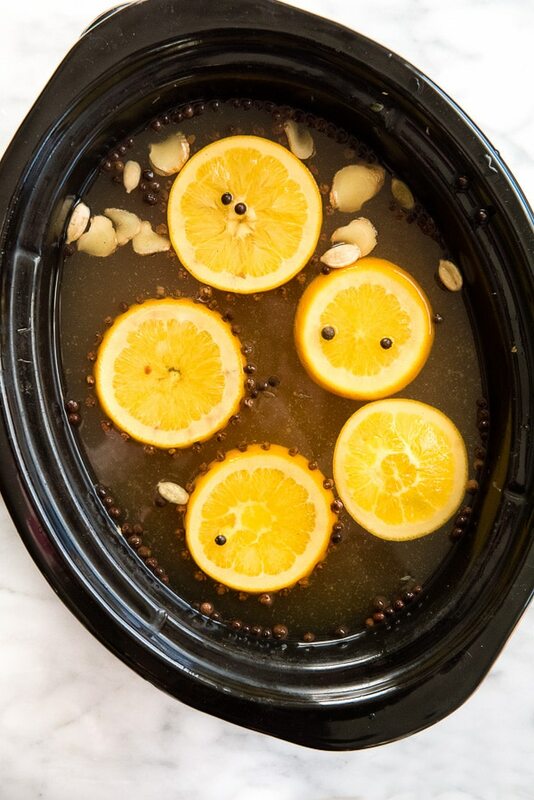 Personally, I love the look of clove-studded fruit and find adding the cloves to the rind of the orange slices to be both pretty as well as it keeps them out of the way of scooping into a mug! TIP: to easily insert the cloves into the orange slices, make a small hole with the sharp end of a bamboo skewer then insert the clove. This helps prevent the clove stem from breaking when being inserted. This almost seems silly to include. Combine all ingredients are added to the slow cooker and cook on LOW for 3-4 hours. Strain the mulled apple cider through a fine mesh sieve before serving. OR line a larger strainer wtih a double thickness of cheesecloth and strain. 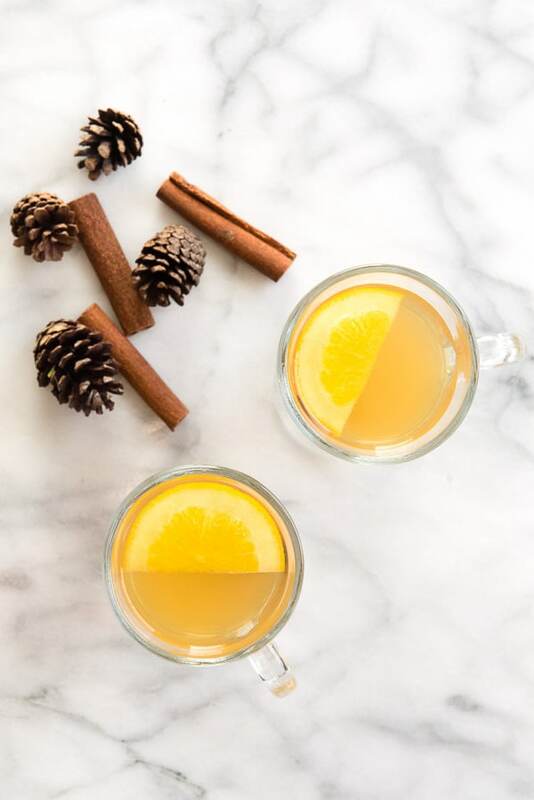 Can Mulled Apple Cider be Spiked? Why not?! I suggest adding your preferred liquor to individual servings (bourbon, whiskey, rum would all be great). By doing so the base mulled apple cider is available for those not spiking it. Keeping it available in the slow cooker on warm is great for gatherings and parties! I love making hot drinks in the winter using the slow cooker. Slow Cooker Hot Buttered Rum is another favorite. It is made adding the alcohol in serving cups so those wishing the warm, buttery drink booze-less can enjoy it too ‘as is’ from the slow cooker. 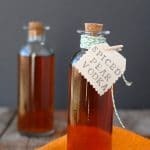 A dash of rum extract can also be added for the warming flavor of rum and no alcohol. Slow Cooker Vampire Punch is a fruity easy recipe for Halloween (but great any time really) with a spicy addition! This punch can also be served cold. 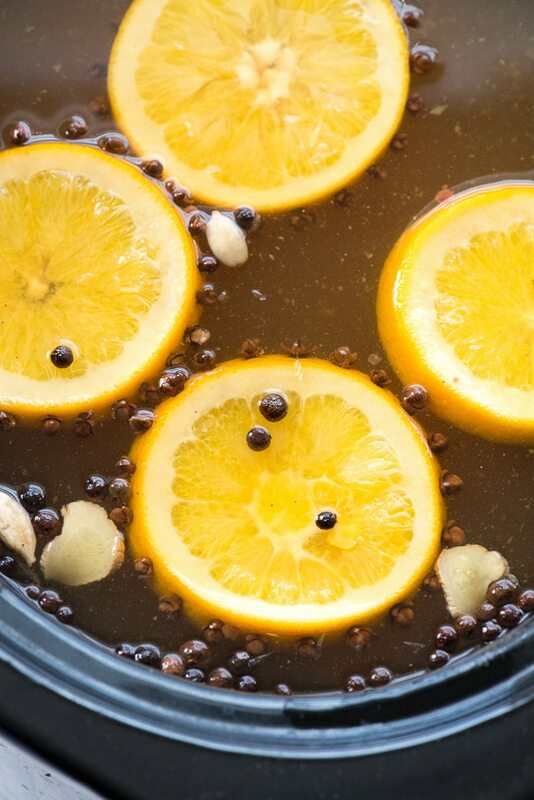 Slow Cooker Mulled Wine is a great option for adult parties for a soul-warming libation. Slow Cooker Pumpkin Spice Lattes let you make fall’s most iconic drink in a large batch! There is nothing better than coming inside after a chilly outing to pick up a Christmas tree, decorating the house outside with lights or some holiday shopping, to be greeted with a house smelling of spiced cider! I really think it is the homiest smell ever. It’s great to make up a batch before going out to do some Christmas caroling too (does anyone do that anymore?) so it’s piping hot when you return home. 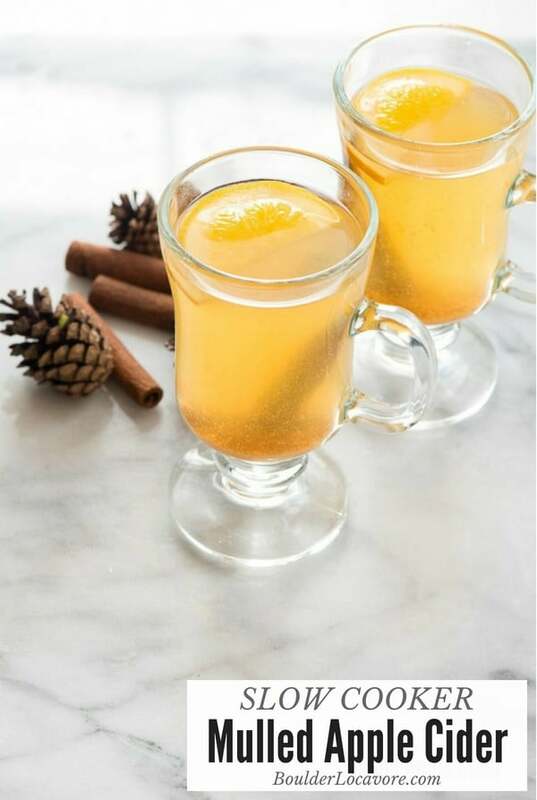 If you’ve tried this Mulled Apple Cider recipe please RATE THE RECIPE below! This slow cooker mulled apple cider has a 'just right' amount of sweetness from the cider itself and a bit of brown sugar. The natural spices create a lightly spiced flavor perfect to take the chill out of any winter day.Recipe may be halved to cook in a 4 quart slow cooker. In a large (6 quart or larger) slow cooker add all the ingredients and cook on LOW for 3-4 hours. Spices can be strained before serving by using a sieve. Tip: to add the cloves to the rind of the orange slices, make small holes with the sharp end of a bamboo skewer first, then the cloves will insert easily and not break in the process. Everyone needs to make this in the chilly months. It’s so good! This is perfect for fall get-togethers! So tasty! This is a delicious way to warm up on a cold night! Plus, the house will smell amazing while it simmers! This is one of my favorite cold day drinks! Love the tip about inserting the cloves! I’m definitely going to try that. No cold weather is complete without this! Just in time for fall this looks so amazing !! So easy to make this in the slow cooker, and very low stress. Love it! Delicious! One of the best parts of fall. This looks like the perfect drink for warming up on a chilly day! This is a fabulous fall and holiday beverage! I’m making it again for our Christmas cookie exchange! This looks super delicious. I have never made an apple cider before but this looks easy enough. I especially love this season for the cider. I haven’t made any yet, but I bought some K-cups and that’s been great. I have hot cider Kcups too; don’t you love that? This slow cooker recipe is really delicious too! This cider looks so good. I can almost smell the scent in the air as it heats in the slow cooker. Another reason why the slow cooker is best to have in the kitchen! I am saving this recipe. It would be so nice to have spiced apple cider on a cold winter night. Yum this looks delicious. I love apple cider but haven’t ever made it myself, this looks tasty and easy enough for me to make! This is a great recipe for a party! It definitely checks all the boxes. Start it ahead of time. Let it smell up your house beautifully. When it’s time to serve, you can just have a cinnamon whisky there for the grown ups to add. I love this. I couldn’t have said it better myself. I will say I added a bit of rum to a mug of it last night and it was great! Slow cookers are great for great recipes that add great smells in the house. I bet that would fantastic! I’ve been looking for a recipe for this and yours looks delicious! So making this over the weekend! I’m so glad! We just got our first snow storm with temps in the single digits today. I have the slow cooker plugged in and warming some up now.